2019, and heading into 2020, has seen my inventory of Farms for Sale, Equestrian properties and Investment Land remain steady. The price/acre remains about the same, except property located close to the Polo/Festival grounds. 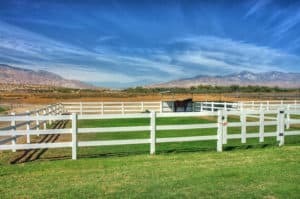 Coachella Valley is rich with it’s Agricultural and Equestrian influences, especially in our East Valley cities of La Quinta, Indio, Thermal, Coachella and Vista Santa Rosa. The influx of desert visitors are discovering the beauty of our Eastern Desert Farms, raw land & Equestrian Estates. Many factors are at work here. Coachella Music Festivals, The International Polo Games, HITS Horse show, The Thermal Club, and the continuing improvements being made to the Jacqueline Cochran Airport, have all contributed to the growing interest in the Eastern Coachella Valley. Call today: 760-285-3578! 4.8 Acre Modern Equestrian Estate for Sale. 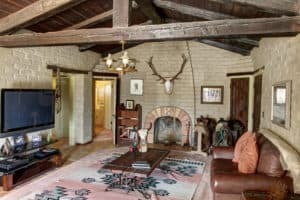 57300 Jackson St., Thermal, $2,900,000 New for 2019 Season! REDUCED $300,000 to $2,600,000!! Remodeled in 2017, with a Sleek, contemporary flair, the ranch style home is now 5 bedrooms/3.5 baths, and finished with extraordinary high end finishes. Add that to large pastures with Palapas for shade, new fences, Ag water for irrigation, PLUS a 7-car climate controlled Garage that even has a gorgeous Lounge/bath area! THE SECOND AVAILABLE FARM, Valor II: Same size, but offered at $2,100,000 includes approx, 4.8 acres, with 2 barns, an irrigated arena, Hay Barn, multiple grassy turnouts, and a 3 bedroom/2 bathroom permitted Mobile home. 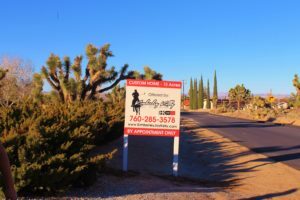 TWO OPTIONS AT VALOR FARM IN THERMAL, CALIFORNIA: CALL ME! 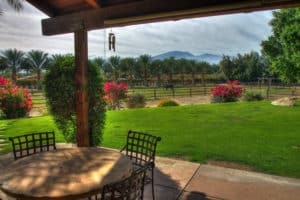 Coachella Farm for sale, two homes, paddocks, gated, private, secure..
Just Listed: 51600 Jackson St., Coachella, CA. $1,649,000. grocery stores, dancing, golf and the nearby hospital..just everything!! ALSO FOR LONG TERM LEASE. NEW IN EQUESTRIAN INVENTORY FOR 2019! Equestrian Business, Willowbrook Riding Club, $2,999,000. Looking for an equestrian business Opportunity? Here it is! Approx. 20 acres in Desert Hot Springs, CA. The Riding Club has been operating for over 20 years, is zoned for up to 200 horses, and currently has a CUP, (conditional Use Permit) for another 40 years! 2 permitted homes, 5 arenas, 2 lit and 1 covered, multiple barns, runs, pastures and glorious VIEWS! 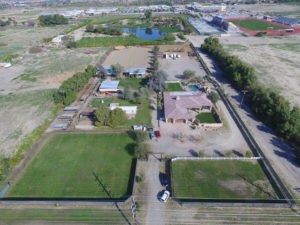 Aerial view of 79784 Avenue 40, Indio, CA. Just SOLD: 79784 Avenue 40, Indio, California. $1,199,000: (IN ESCROW in 45 days! SOLD!!) Represented the Sellers. Hard to find, small acreage, WITH Custom home (built in 2001), saltwater Pool/raised Spa/outdoor BBQ and eat area..VIEWS! There is a 4 horse barn with two tack rooms, two other tack rooms, a huge, lit Arena with two observation stands. Multiple turnout paddocks, hot walker, round pen, 12 pipe pens with covers. There is also a 35 ft. by 35 ft. building perfect for hay storage, rig parking, two RV hook ups, a mobile home pad and septic system, and a private well. Dual entrances making it convenient and easy to access. 5 minutes from the 10 fwy. A super buy!! Original Farm house, a 4-stall barn, well and Ag. water in Thermal, CA. JUST SOLD: 85495 Avenue 61, Thermal, CA. (Listed for 4 days, and now IN ESCROW..SOLD!!) $725,000. Represented Buyers and Sellers. This 16.8 acre parcel of flat, usable land has frontage on Avenue 61, a permanent house that is 3 bedrooms and 2 bathrooms, and a 4-horse barn. Private Well and also Ag. water for irrigation, make this farm a superior value. I didn’t think this hard to find, smaller farm, with a home and barn would sit, and it didn’t! Wow..the new owners are doing wonderful improvements to this farm. Buying BEFORE the farms with homes are gone! 52855 Jackson St., Coachella, CA: AVAILABLE FOR 2019! Approx. 76.8 Acres located on the corner of 53rd/Jackson St. Elevated Farm with Startling Southwest Mountain Views. Currently a horse layup facility, this is one of the ONLY remaining large Farms left between La Quinta and Indio. $8,438,000 Approx. $115,000/acre. 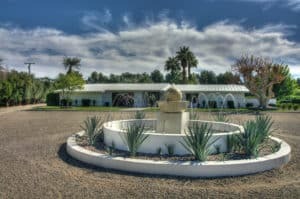 This farm is being considered for zoning change to Commercial Entertainment, and being so near the Coachella Music Festivals…wow! Two large reservoirs, add to the value of this elevated, corner parcel of land. Talk about VIEWS! 360 degrees and sitting high enough to appreciate. You can see The Madison Club, and Merv Griffins’ ranch just West up 53rd Avenue. 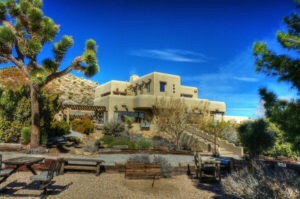 Just a breath taking location..
85501 61st St., Thermal, CA. ; AVAILABLE FOR 2019. 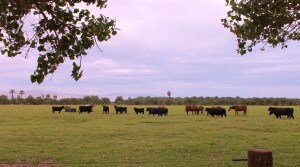 20 Acre working farm situated very near the HITS horseshow entry gates. Fenced, private Well and CVWD water for irrigation. 10-stall barn with grooms’ quarters, and a hot walker. Over-sized Hay Barn, and lots of parking. $1,500,000 Approx. $75,000/acre. The seller just installed approx. 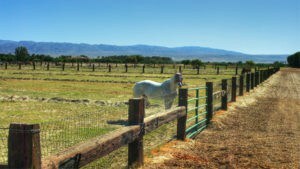 $40,000 worth of horse safe 6 ft. tall Fencing. This farm offers a large mobile home, a remodeled 1940’s home, (Permit status unknown), lots of storage barns, plenty of water, spectacular Eastern Chocolate Mountain views. Frontage paved road on Avenue 60. The entry driveway has an electronic gated driveway. Hip Camps and Glamping are the newest craze, and this estate could easily accommodate either. There is a flat site perfect for your barn, and you can literally ride out the back of this property onto riding trails. Or…ride right onto the Black Rock Canyon Campgrounds and hit one of the horse friendly trails. The views from the porch that runs the entire length of the front of the house are unobstructed! Just sold first quarter of 2019. Buildable lot in Flores Montanas, La Quinta. Represented the Sellers. Farm in Thermal of approx. 19 acres. Represented the Buyers for this future equestrian Layup Farm. FREE property consultation for your Farm, Equestrian property, or Raw Land evaluation. Kimberley Kelly, 760-285-3578.